For all wordsmiths from all around the globe, here comes an amazing word guessing game called Word Travel. Providing with challenging levels, exciting and brain-tickling gameplay, beautiful visuals and a chance to compete with other players, this game has been easily chosen as a Word Game of the Week here in our office. Let’s see what it is all about! What is Word Travel all about? Word Travel as an entertaining and addictive word puzzle game is offering its players to test their vocabulary skills and enhance their vocabulary knowledge by guessing words fast and connecting the letters to get the right words. Developed for android and IOS users with simple control and incredibly neat graphics, players will enjoy tons of word guessing challenges and for every correctly solved word puzzle the player will get fuel for his airplane. Exciting adventure around the globe with the chance to become the ultimate word traveler, this word puzzle is very enjoyable for every puzzler out there. 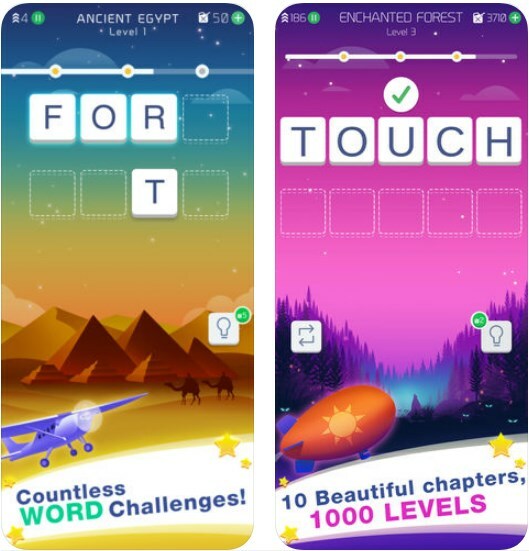 On this word connect puzzle players will enjoy amazing and challenging features which will help them to better their vocabulary with each solved challenge. Players on the game are asked to be fast when guessing the word puzzle and correctly connect the letters given in order to get the right word needed. On this word puzzle game, players will have fun and enjoy the adventure with mix of history and geography while hooping on their airplane and earn the fuel by answering correctly the word challenges. With 10 chapters with 30 levels each, players will get to solve different, unique and challenging word puzzles while trying to progress further and earn high scores. The players with the best skills will have the chance to earn the highest scores and get to the top of the global leader board of this incredible word game. If the players need help solving a word puzzle they can use the hints to help them progress. Start the word guessing journey and earn the title of the best word traveler. Download it for free on Google Play and App Store now to test and enhance your vocabulary!